- Attend an art workshop. 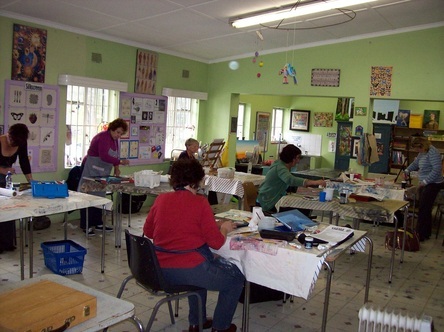 ​- Attend art / textile painting classes. - Do you need an illustrator? ​- Buy one of my books. We run a drawing course for beginners, weekly ongoing classes for the intermediate & advanced art students, and adult textile painting classes which are great for all levels. We also offer monthly workshops on a variety of crafts, styles, techniques & media. -Learn how to see like an artist & draw realistically. ​Oh no, we are fully booked! dye fabric, discover layering, using stencils, templates, silk-screens & stamps. It’s fun & exciting! Great for beginners. Ongoing classes are offered for the intermediate & advanced art student, who has drawing skill but requires assistance in taking their art style and technique to a new professional level. Take your medium of choice to a whole new level. Classes cover a variety of media: oils, acrylics, watercolours, oil & soft pastels, coloured pencils, graphite, charcoal & mixed media. ​I tutor a digital illustration, diploma course​ through the London Art College in the UK. ​You can view it & the other great courses by clicking here.